I just posted a DotNetNuke module/tutorial that I hope demonstrates a good use of Silverlight. It is a dashboard gauge that a user can open up and keep opened all day and it will automatically update. Most importantly it uses caching so that the database is hit only once every 30 seconds no matter how many "clients" are connecting to it. I estimate that in 1-2 years interfaces such as this will be expected from web developers. This project is another in a series of projects in collaboration with Jeff Paries. 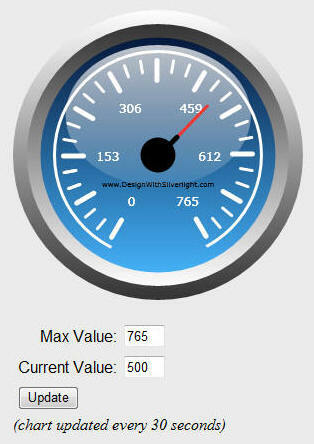 This project started with a post he made: "Silverlight Gauge Graphic" where he offered: "In case anybody needs it, here's a Silverlight/XAML gauge object". Jeff Paries has a book on Silverlight called "Foundation Silverlight 2 Animation".